The ultimate post-nuclear tabletop experience of Fallout: The Board Game is about to arrive, and there's one element of the game that we've been saving for this moment. We've done an overview of the game as a whole and discussed the six main ways you can interact with the world of Fallout. We've discussed the development of your survivor and the fearful fights you may encounter. But one thing we haven't thoroughly dug into sits at the very heart of your Wasteland experience, and that is the intricate story you and your fellow surivivors will tell and the challenging, impactful decisions you will make to shape it. Today, in preparation for the game's imminent release, we explore the incredible narratives that Bethesda has developed and how they translate to the tabletop. To begin any game of Fallout, you'll select one of the game's four scenarios: The Commonwealth, The Capital Wasteland, The Pitt, or Far Harbor. Each of these scenarios tells a complicated story of factions versus faction, offering two distinctive ideologies you can side with. An example we've considered a few times is that of The Commonwealth, which considers the core conflict of Fallout 4: Synths, or synthetic humans. In The Commonwealth, you must choose between two sides: the Railroad, which believes synths are sapient and deserve independence, and the Institute, the organization responsible for the creation of synths that seeks to maintain control over them. Each of the three other scenarios features a similar battle between freedom and security. As you progress through the main questline of the scenario, the two factions will gain influence of their own and agents of each group will pop up across the game board. This progression is dependent on how the survivors choose to interact with the story. 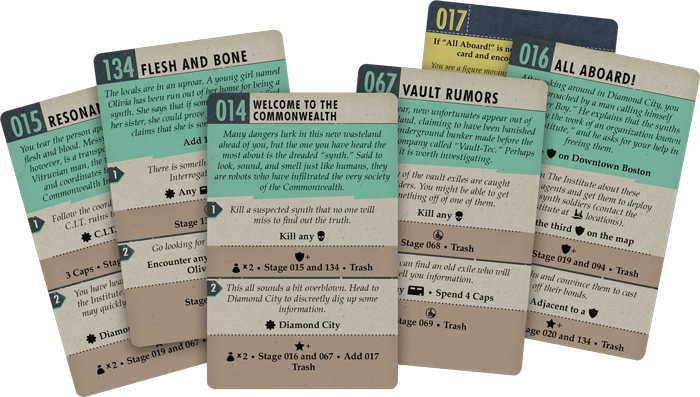 For example, card 014, which introduces The Commonwealth scenario, offers two choices: to kill a humanoid or to take the Quest action at Diamond City. 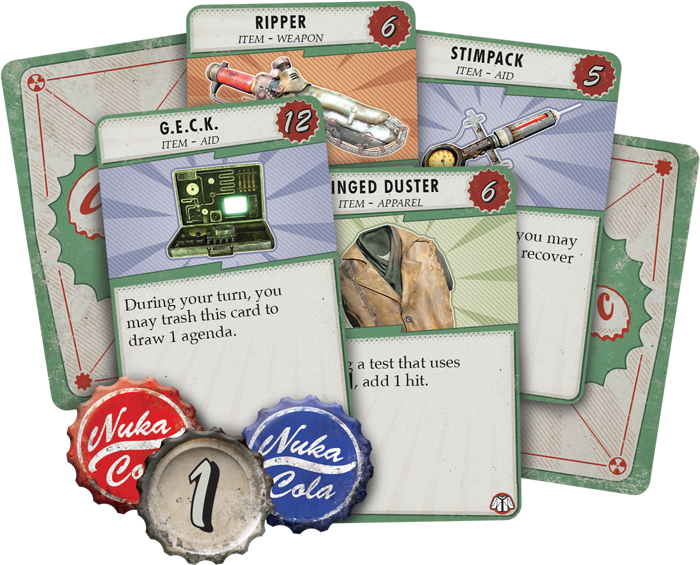 Whichever action is done first will result in the effects listed below, offering loot to the survivor who completed the quest, adding new cards to the game in play, and progressing either the Railroad or the Institute. While the loot and new cards may be enough motivation for a survivor to complete any quest objective, influence cards encourage survivors to side with one faction or another. It is through this faction-influence interaction that alliances may develop between survivors. If you side with the Institute alongside another survivor, you may be inclined to help each other. Of course, you still have personal goals and motiviations, but ultimately, the advancement of the Institute helps you both in terms of influence. 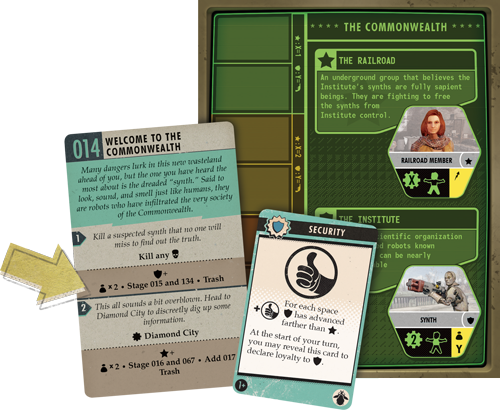 Early on, you may not actually know who is allied with each faction, but you do have the option to turn your faction-based influence cards faceup, declaring your alliance and giving you immunity whenever you encounter the agents of that faction on the board. Declaring this loyalty will become more and more important as the board fills up with faction agents. Beyond the main storyline, a number of side-quests and location encounters will be available to survivors throughout the game. In the example above, the quest card is placed face-up on the table, so each player can see the outcome of all options. While the main- and side-quest cards will always be visilbe in that way, location encounters are presented a bit differently. There are three types of location, each matching a different encounter deck: Wasteland, Settlements, and Vaults. Whenever you land on the same space as one of these locations, you have the opportunity to Encounter it. Encountering a location is different than questing, because you won't know how your choices will impact the game when you have to make them. Instead, another survivor will read the card and the possible actions aloud, keeping the results a secret until you have made your decision. While some choices are forced based on your survivor's traits, often, they will require you to make a skill check. For example, a card may offer two options: "Hack into an old Register • 3" and "Search for useful equipment • 4". Both of these will feature different results whether you succeed or fail at the skill check. Making a skill check is similar to fighting in that you will roll all three of the V.A.T.S. dice. However, you will ignore the vulnerable areas on the dice, instead focusing solely on the number of hits. The number listed after the skill or skills is how many hits you need to succeed, and, as in battle, you're able to reroll for each of the relevant skills you have acquired or by discarding a well-rested token. The outcomes of both quests and encounter can be numerous. 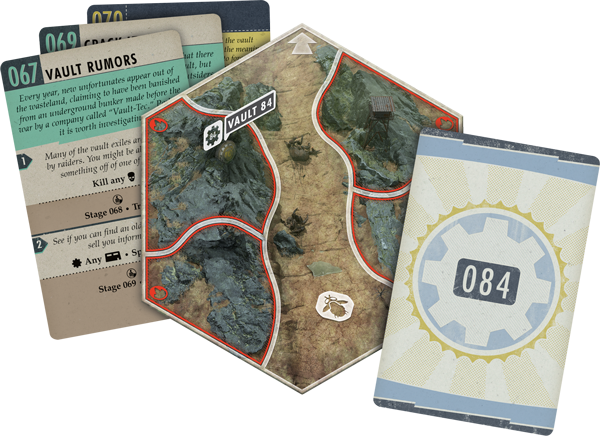 Some will influence the game itself, asking you to add a card to one of the encounter decks, stage a card by placing it face-up for all to see, advance one of the factions along the Power Track, or permanently removing a card from the game. Other results may influence your survivor individually, granting you XP, Caps, new Traits, Influence Cards, Loot, Special Items, or, in the case of Settlements, the opportunity to Shop. Encounters are one of the best ways in the game to add equipment to your survivor board. Wasteland locations are a bit dangerous, often called home to critters and looters, but braving the unknown can reward you with Caps or loot. At a settlement, you're more likely to run into some people, posing more difficult choices, but offering you the opportunity to poke around in the shop. Whenever you get the opportunity to shop, you can sell an item to collect Caps, buy items at full price using Caps, or use your wily charms to convince a Companion to join you. The shop's stock is rotated throughout the game and always visible to all players, so if you have your eye on something particular, you'll want to collect the Caps and get to a settlement quickly in order to pick it up. Those items won't hang around long. The third type of location you can encounter is the Vault. These elusive spots are well-hidden in the Wasteland, and you cannot encounter them until the Vault decks are available. A Vault deck may be constructed at some point during each game, often after a survivor hears whispers while wandering through a local settlement or gets a request from a friend in need. Either way, only once a Vault has been introduced by the game itself can it be encountered by a survivor—another reason you may wish to rush across the map to beat an opponent to the punch. 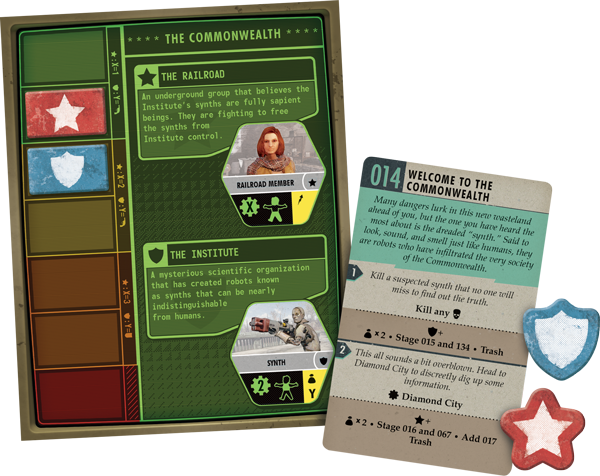 There you have it—your crash course on the narrative experience of Fallout: The Board Game! From completing quests to executing skill checks, from visiting the shops to exploring the vaults, you're well prepared to take on the post-nuclear Wasteland when it arrives at your local game store! 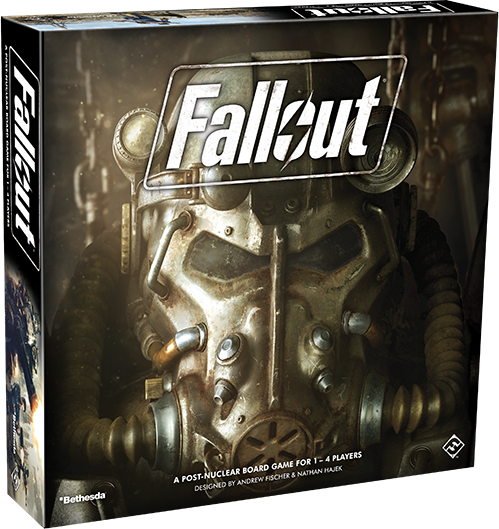 Pre-order Fallout (ZX02) at your local retailer or online through our webstore today!